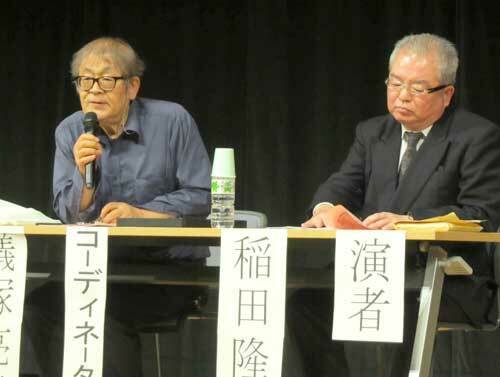 Psychiatrists Ryoji Aritsuka (from left) and Takashi Inada spoke out about how wounded patients　recovered from their trauma. An open lecture titled, “Exploring the emotional wounds of the Battle of Okinawa” was held on December 13 in Nishihara Town. A woman who experienced the Battle of Okinawa and has suffered Post-Traumatic Stress Disorder (PTSD) symptoms for many years told of her agony and hardships. Two psychiatrists advised that allowing patients to share their pain would relieve them. Tsuruko Uchihara, 84, who experienced the Battle of Okinawa at the age of 14, escaped from the battlefield in the southern part of mainland of Okinawa. The memory of stepping on corpses on the way to escape, plagued her. On the night of that experience, she apologized to the dead, kneeling on the ground, saying, “I’m really sorry because I could not see anything in the middle of the night.” However, she could not sleep, because she could not forget the feeling of stepping on the corpses. 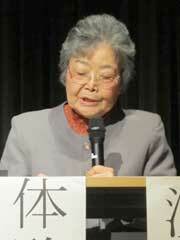 Tsuruko Uchihara, a survivor from the Battle of Okinawa, spoke out her experience in Nishihara Town on December 13. After the war, she became a teacher. When 40 years had passed after the war, she began to suffer pain from an unknown cause, a burning sensation coming up to the top of the body from the soles of the feet. Surgery and acupuncture did not help ease her pain away. She retired from her job at 55 years of age. She had to spend about 30 years almost bedridden. Aritsuka, her attending physician, said, “patients should be given a proper diagnosis, and they have to know that they are not isolated from others. These things will lead them to be cured.” Furthermore, the doctor said, touching on his experience in Fukushima, said, “There are many patients who suffered from the same unexplained symptoms in Fukushima as PTSD patients from the Battle of Okinawa. Some patients improved their health with the same treatment as that given to PTSD patients from the Battle of Okinawa. The survivors of the Battle of Okinawa taught me this treatment.” He said he was grateful to them.